Rather dirty white flowers, VIII–X, with dark anthers; mid-green foliage. Grown at Woburn before 1825; listed by Conrad Loddiges (Hackney, London) as early as 1826, and later by J. Smith (Monkwood Grove, near Ayr, Scotland) in 1830. 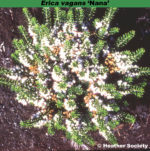 Plants under this name probably represent more than one clone, and they would be better listed as Erica vagans f. alba. Named from the latin albus = white; after the flower colour. White flowers, VII–IX; mid-green foliage; spreading habit; height 26–30cm; spread 46–60cm. Wild-collected; found in northern Spain by M. Zwijnenburg (Boskoop, Netherlands) in 1975; introduced by P. G. Zwijnenburg in 1983. Off-white flowers, VIII–XI, in long spikes; bright green foliage; height 31–45cm; spread 61–75cm. Outstanding. Wild-collected; found on Goonhilly Downs, the Lizard, Cornwall, England; introduced by Treseder & Sons (Truro, Cornwall) by 1966. Named after the county where it was found, and the flower colour. Sport on 'Cornish Cream' found by Mr Watson of Callender Propagators, Scotland, in 1995; named and introduced by him. Name alludes to the parent cultivar and to the foliage colour. Off-white flowers, VIII–XI, with red-brown anthers; mid-green foliage; vigorous; height 31–45cm; spread 61–75cm. Very dense flower-spike with about 8 flowers/branch. Introduced by James Smith and Sons (Darley Dale, Derbyshire, England) before 1925. Named from the colour of the flowers. White flowers, IX–XI; bright gold foliage throughout the year; slow-growing; height 10–15cm; spread 31–45cm. Similar to 'Valerie Proudley'. Seedling; found about 1984 by H. H. Lunn at Crail Nurseries (Newstead Abbey Park, Linby, Nottinghamshire, England); introduced by Crail Nurseries in 1987. Named after the finder's wife, Diana M. Lunn. Off-white flowers, VIII–X; mid-green foliage; height 16–20cm; spread 46–60cm. One of the better white-flowered Cornish heaths but nothing is known of its origin. White flowers,with bright yellow anthers fading to pale tan after anthesis, VIII–X; mid-green foliage, young shoots with bright golden tips in spring; height 31–45cm; spread 61–75cm. White flowers, VIII–X, in a compact spike; bright green foliage; height 21–25cm; spread 31–45cm. The russet-coloured dead flowers low down on the spike are not so noticeable as in other white-blossomed Cornish heaths. Wild-collected; found by P. D. Williams (St Keverne, Cornwall) on The Lizard, Cornwall, England; introduced by 1927. Named from St Keverne, Cornwall; albus = white. Off-white flowers, VIII–X; mid-green foliage; open erect habit; height 31–45cm; spread 61–75cm. Listed by Wallace in 1914. Named from Greek; leuco- = white; anthos = flower. 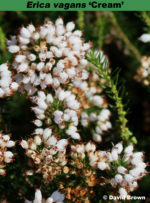 White flowers, VIII–X with pale brown anthers; bright green foliage; height 21–25cm; spread 46–60cm. Wild-collected; found by Mr & Mrs Maxwell in 1923 while on their honeymoon, collected on the Lizard Peninsula, Cornwall, England; introduced by Maxwell & Beale (Broadstone, Dorset) in 1925. Named after the mythical land said to lie beneath the sea off the Cornish coast. Named from nanus = dwarf. White flowers, IX–XI, sparse; dull golden foliage, with bright yellow young shoots in spring, turning bright green in winter; height 10–15cm; spread 26–30cm. Subject to windburn particularly in winter and spring and may revert to dull green foliage. 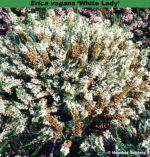 Sport on a normal plant with white flowers (E. vagans f. alba); found at Aldenham Heather Nursery (Watford, Hertfordshire, England) by Brian W. Proudley in 1965; introduced by Aldenham Heather Nursery in 1968. Named after the raiser's wife. White flowers, VIII–X, abundant; dark green foliage; compact habit; height 21–25cm; spread 31–45cm. Seedling; found by S. Dawson in 1970 in his garden at Wakefield (Yorkshire, England). Very long racemes of white flowers; VIII-X; foliage mid green; habit vigorous requiring pruning to avoid straggly plant; height 50cm; spread 85cm. Wild-collected; found on Goonhilly Downs, Cornwall, England, by J. N. Anderson (Broadhurst Nursery, Grampound, near Truro, Cornwall) in the autumn of 1981; introduced by Broadhurst Nursery. The flowering stems were 16 inches long. Named for the length of the racemes of flowers. White flowers, VIII–X, with attractive golden anthers; mid-green foliage; height 16–20cm; spread 46–60cm. Found by C. Benson (Farington, Preston, Lancashire, England); introduced by C. Benson by 1977. White flowers, VIII–X; bright green foliage; vigorous with an open habit unless well trimmed; height 46–60cm; spread 75–100cm. Wild-collected; found on Goonhilly Downs, Cornwall, England; introduced by Treseder & Son (Truro, Cornwall) in 1965. Name alludes to the flower colour, and habit. White flowers, VIII–X; bright green foliage; vigorous; height 46–60cm; spread 61–75cm. Introduced by 1985, perhaps by Neil Treseder (Truro, Cornwall, England).